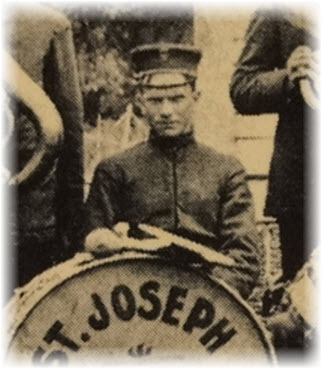 Cletus John MAY, the serious-looking young man with the base drum, was born 10 July 1888 in Portage County, Ohio. He was the son of John L. MAY and Mary J. PAULUS. Cletus’s mother, Mary J. PAULUS, was the daughter of Johannes Joseph PAULUS and Eva KNAPP. Interestingly, Eva KNAPP was the daughter of John Adam KNAPP and Elisabeth ANDES. John Adam KNAPP was the brother of our immigrant ancestor, Franz Adam KNAPP. Remember – I told you there would be KNAPP connection in there somewhere! I don’t know much about Cletus’s siblings, except his two youngest sisters, Victoria and Mary, both became nuns. Pictured below is Sr. Mary Cordilia of the Sisters of Notre Dame. 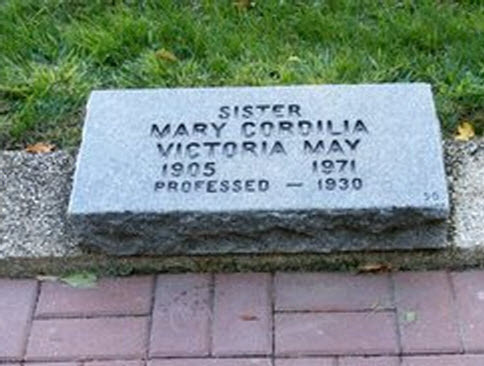 Sr. Mary Cordilia became a nun in 1930. She died 20 Nov 1971 and is buried in Resurrection Cemetery in Chardon, Geauga, Ohio. 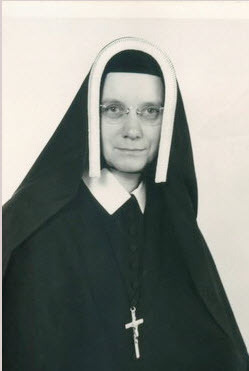 Also pictured below is her younger sister, Mary Martha, who eventually became Sr. Mary Damien, also a member of the Sisters of Notre Dame order, according to information posted by another researcher on the Find-A-Grave website. It’s interesting that the two youngest sisters ended up both being sisters in the same order: Sisters of Notre Dame. I wonder how often they got to see each other? Probably not too often, especially since Sr. Mary Damien was in California. Visiting family was probably a rare opportunity for a nun in those days. On 17 Nov 1885, Cletus married Rose Cecilia FARNBAUCH in Portage County, Ohio. Together, the couple had five children, including four daughters: Helen M., Kathryn E., Anna C. and Norma M. – plus a son, John R. MAY. Cletus John MAY died 17 July 1945 in Suffield Township, Portage County, Ohio. Cletus and his wife, Rose, are buried in St. Joseph Catholic Cemetery, Randolph Twp., Portage County, Ohio. He was buried 20 July 1945. Click this link to see a photo of his grave on Find-A-Grave. Unfortunately, I do not yet have a copy of his death certificate or obituary. Tip: The Ohio Historical Society maintains an index of Ohio deaths from 1913 – 1944. You can also order copies of death certificates online from their site. Plus a tremendous help is the site maintained by the Church of the Latter Day Saints called FamilySearch.org – which has actual images of death certificates which lists the cause of death and other useful information. If I get the chance to hit the library in Ravenna, however, I will check the microfilm copies of the Record Courier newspaper to see if I can find his obituary. That might shed more light on his life. If anyone out there knows anything more about Cletus – or other members of his family – please don’t hesitate to chime in and share what you know. This entry was posted in Family History, Genealogy How To's, Knapp, May, Paulus, Photos, Sisters of Notre Dame, St. Joseph Band and tagged Andes, Cletus John May, John Adam Knapp, May genealogy, Paulus, Sister of Notre Dame. Bookmark the permalink. Thank you so much. The only time I got to see Sister Cordelia was at their annual chicken dinner fest at Notre Dame Academy. She showed us (my M & D & sibs) the 1st microwave ever in early 60’s. And Sister Damien twice at M & D’s home in Norton. 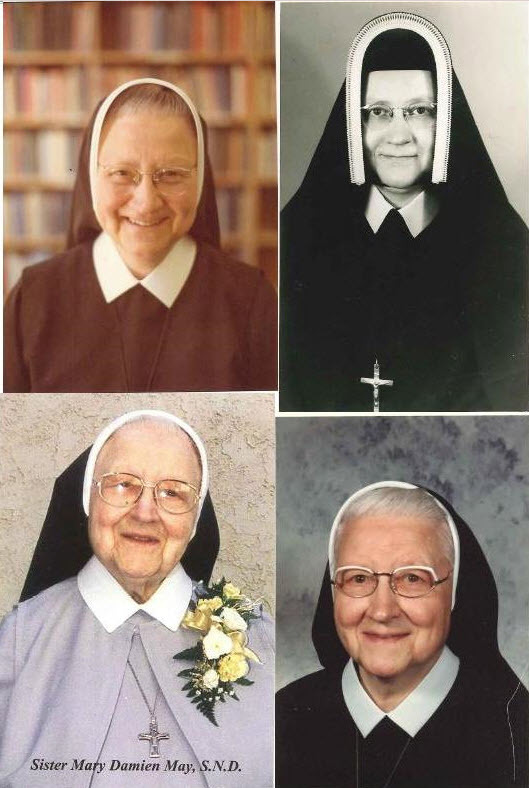 Sr. Mary Damien, S.N.D. taught seventh grade at St. Helen School, South Gate, CA during school year 1954-55. I was in the 6th grade at that time and was eager to be entering her class the following September. But she was transferred to another school during the summer. Twelve years later when I was teaching 8th grade in a catholic school also in Southern CA, I received a letter from her requesting data about my students that she needed for her master’s degree. I recognized her name and address and wrote back to her with the data and told her how I remembered where she was teaching 12 years earlier. She was indeed surprised and a wonderful woman. Thank you for sharing your memories of Sr. Mary Damien, S.N.D., with the readers of Knapp Notes. There are some great photos, and I love it all! I attended Notre Dame Academy with 4 of my cousins who were Mereci Paulus Kramer children. Sr Damien was there working while we attended school there and I had no idea we were related. So crazy! Not sure if my earlier comment got through. Cletus may is my grandfather; you can contact me if you want more info. Very interesting about Cletus May. I knew a Cletus May years ago who owned a farm at the NE corner of Waterloo rd and May rd in Suffield . I think he died in the late 1960’s. Could be a relative. I’m the one who posted everything on findagrave & the photo’s. Joseph & Eva Paulus are my great great great grandparents. I’d love to see all the photo’s you have. Mary J Paulus May & John May are my GG grandparents. Excellent work on Find A Grave, BTW. 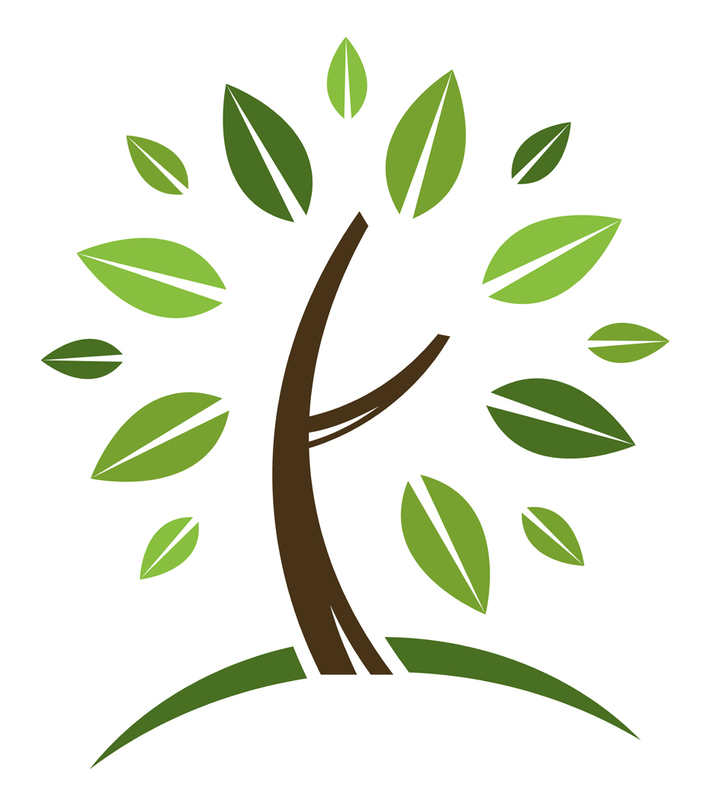 Get in touch with me through Knapp Notes and we’ll see if we can work together to fill in a few gaps in our family trees!